Wilmington or Myrtle Beach: Where Should You Retire? 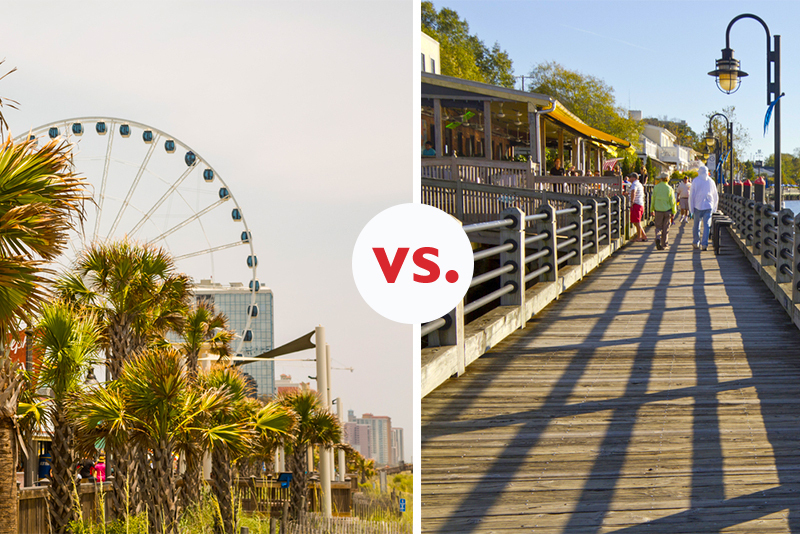 Do you want the excitement of Myrtle Beach, or the relaxed vibe of Wilmington? It’s no secret that North and South Carolina are highly sought after destinations for 55+ adults looking for somewhere to retire. Both states offer moderate temperatures year-round, affordable costs of living, reasonably priced homes, incredible sights to see, and plenty to do. And, there’s absolutely no shortage of charming towns to choose from between the two Carolinas. Among some of the states' top retirement destinations are the towns of Wilmington, North Carolina and Myrtle Beach, South Carolina. Although the two beach towns are less than two hours apart, they each have their own character and charm, and offer residents a variety of different amenities to suit all sorts of lifestyles and budgets. With 60 miles of coastline, countless championship golf courses, and entertainment galore, Myrtle Beach has certainly made a name for itself as one of the most popular vacation spots in the southeast, but the locale is also a desirable spot for active adults looking to settle down in a vibrant beach town that always has something going on. The area’s sandy beaches and fishing piers offer residents plenty of opportunity to stay active and have fun in the sun year-round. The Grand Strand is also a hub for entertainment with shows and live performances happening nightly at places like the Alabama Theater, Carolina Opry Theater, and House of Blues Myrtle Beach. Additionally, the trendy Boardwalk & Promenade offers plenty of entertainment with everything from an aquarium and Jimmy Buffett’s Margaritaville restaurant to dueling piano bars and local boutiques. Shopping is another big draw to the area with plenty of retail options in the area that range from upscale specialty shopping to outlet malls. Beyond the beaches, entertainment, and shopping, Myrtle Beach has several award-winning medical facilities, an international airport, and residents pay lower taxes since South Carolina doesn’t tax Social Security benefits and offers a considerate retirement-income deduction on state taxes. There are almost 30 age-restricted and active lifestyle communities in the area, with 10 of them being in Myrtle Beach itself. Some popular communities include the Myrtle Beach Golf & Yacht Club, Del Webb Myrtle Beach, Carillon at Tuscany, and Waterside Pointe. Across the state line in North Carolina is the city of Wilmington, which is nestled between the Atlantic Ocean and the Cape Fear River. The small city is a favorable location among 55+ adults for its abundance of Southern charm, rich history, tranquil scenery, and laid-back atmosphere. Known for its picturesque tree-lined streets and stately antebellum homes, Wilmington offers residents a wealth of recreational and cultural amenities as well as plenty of historic sites and museums to explore, including one of America’s oldest theaters — Thalian Hall, the World War II Battleship North Carolina, and Cape Fear Museum. The town is also well known for its many local festivals that draw large crowds and take place throughout the year, such as the North Carolina Azalea Festival and Riverfest. Wilmington’s River District is another popular attraction that’s is packed with award-winning seafood restaurants, cafes, and local shops. The area’s 30 miles of beachfront and 40 golf courses are also fan favorites when it comes to spending time outdoors. Additional conveniences in the city include two hospitals, an international airport, free trolley, and local university that offers continuing education opportunities. Wilmington is an ideal location for someone who wants to settle down in a coastal city that’s affordable and full of charm with a small town feel. There are 14 active adult communities in the Wilmington area that are a mixture of new and established properties that include Brunswick Forest, St. James Plantation, Del Webb Wilmington, and The Village at Motts Landing.